Ryan Hawk has created a diary in the THP Forum to follow his journey in a unique testing of a combo set from Cleveland Golf. Here is an excerpt from the first post and you will be able to click the link below and continue the read and follow along through his weekly updates. Most of you know that Cleveland Golf introduced an extension to their 588 line of irons this year. We’ve had quite a bit of feedback already on all three sets in the new series – the Alititude, MT, and TT irons. Within these three sets of irons are three different profiles that are interchangeable in length, loft, and lie – giving consumers the option to build a set of irons that fits their specific needs while avoiding the confusion of combining mismatched specs. It’s somewhat unprecedented in that these combo sets are extremely accessible, playable, and customizable for everyday golfers like you and I. Something a little strange happened early in the year though. Tour players started gravitating towards the combo sets. That would be true. However, this is the first time I can recall a dedicated group of Tour staffers playing an oversized game improvement iron that is marketed towards the mid and high handicappers of the world. How many Tour players have you seen play one of these? Not many. I can almost hear the gasps sitting here at my computer. Tour players utilizing a big, offset, strong lofted, hollow back shovel? Sure enough. 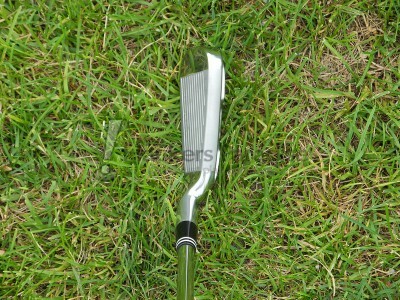 In fact, Cleveland has more MT’s in play than any other company’s utility iron. Here are the names of a few guys that put at least one, if not two, into play at the bottom end of their iron set. Not a bad list of guys right there – an up and comer that has come close to winning some PGA Tour winners, and two Major winners. They’re all using an iron style that some amateurs would scoff at. MT (and a TT) irons are being mixed with sets like the 588 CB’s, 588 MB’s, CG7 Tours, and CG16 Tours by some of the world’s best golfers. So, that begs the question – how can amateurs benefit from a combo set? Also, how should they be putting this set together? We’ve seen combo sets available via mass production before, but they’ve had a little different appearance to them compared to the 588 line – blade scoring irons, small cavity mid irons, and slightly larger cavity back long irons. The 588 line offers that, yet they also offer a somewhat more approachable way to try the combo set, one that offers every level of precision and forgiveness available in iron design. HI,, I have tried going through all the forums But I need some help ..I had a set of Cleveland CG4’s ,,They were great ..I then decided at 64 it would be a good idea to move to the longer CG16’s .Big mistake as these clubs have way more offset than the CG4’s..I need closure on all of your tests.The long irons [4-5] which do you like better the Altitude’s or the MT’s.. THe shorter irons which is better the Cleveland TT’s or the MT’s ..and which combination is the best ..Tom ..From the the home of Graham Delaet..